I asked my purchasing assistant, Ms Google, to find everyone interested in selling me a Moeller fuel tank. Great Lakes Skipper, a production boat repair parts supplier that also sells production overruns, was one of the hits with a number of oddly shaped tanks not in the catalog. The sender and fuel supply barb show some corrosion like the tank has been in the warehouse for a long time. I just checked, they don't show the tank any longer. Great Lakes Skipper sells through several channels, here is their listing from www.ebay.com/itm/Moeller-Marine-FT3317- ... _cvip=true. I'm not sure that is much help but that's how I found it. I will be doing some shaping of the stringers and tank support to match the bottom slopes on the tank. I added a third wrap of flax packing on the rudder shaft - three is better than two, right? Hope so. I suspect getting it out is harder than getting it in. The hydraulic cylinder is mounted too. Also getting the fuel tank sorted out. It is about 3" aft of the design location with a plywood support. A tight turn on the fill hose fits. No idea where the fill will be...back there somewhere. Maybe I should rotate the tank 180. The rudder packing gets very little wear because the shaft rotates so little. I've never changed mine in over ten years. There's no hope in getting to the rudder without removing the tank. There will be a deck above the fuel tank and I won't even be able to see the steer parts. Heck, even if I could see it I still couldn't reach it. I can hardly fold enough to reach it without the tank in the way. As Bill point out, there isn't much there that should need maintenance. A leaking or too tight stuffing box and leaking hose fittings are worrisome until they aren't. What sized ID are you using for your exhaust. 4" or are you reducing it and if so to what diameter? Thanks Matt. I'm looking forward to getting it in the boat. I would welcome advice/experience with boat mufflers. Good Morning! New to the forum. I am building the Belle Isle. Can anyone help me find reference material for spiling the mahogany side and bottom planking? I am fast approaching this step. The router method has been tossed around but I am have never seen it done. 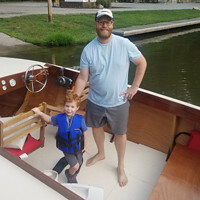 I haven't found good photos or videos of the process in action, but Don Danenberg has a description on his website: http://www.danenbergboatworks.com/Planking.htm about half way down the page. He uses a custom base/fence on a laminate trimmer with a spiral straight cutting bit. It's a way of getting smooth tight fits between plank edges and works well for both antiques boats with thicker planks and for veneered boats with their 1/8" or so thickness planks. The only tricky part of the process is near the ends of the boat where the planks meet the bow stem on planked boats (veneered boats are less complex). Several builders here have used the process and will chime in and show you I am sure. Welcome to the forum Doug. I have seen the results, but not the process of the router spiling on planked boats. I started spiling when I started diagonal planking. I wanted tight joints for all the layers, more for practice than necessity. I used a block plane and I like the control it gives me. Picking through my posts from about page 3 you can see the method I used. I would use that method again. Sharpening plane irons may scare some people off. I stick strips of sand paper to a flat surface (1"thick glass or marble) in progressive grits, several licks from 80 - 2000 using the sandpaper like grinding stones and I have an extremely sharp plane iron with a mirror finish. Cheap and fast.